BOWMANVILLE, Ont., Canada — David Brabham and Scott Sharp are familiar with the victory lane at the fast Mosport International Raceway, northeast of Toronto. Both Acura drivers have won at the Canada track quite often. 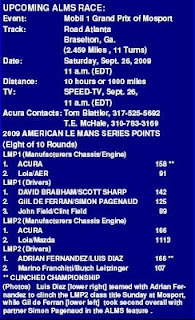 On Sunday in American Le Mans Series’ eighth 2009 race, the Acura pair made it look easy by driving the No. 9 Patrón Highcroft Racing Acura ARX-02a prototype sports car to another Mosport winner’s circle celebration in the two-hour, 45-minute Mobil 1 Grand Prix of Mosport. 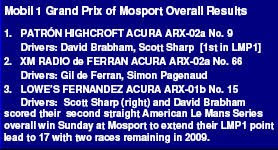 The victory for Brabham and Sharp was their second consecutive ALMS overall after a win at Road America two weeks ago, and extended their LMP1 class point advantage to 17 with two races remaining on the 2009 ALMS calendar. 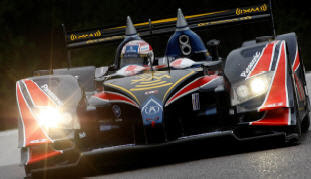 The duo also won at Mosport last year in the LMP2 division. For the fifth time in 2009, Acura cars scored a 1-2-3 sweep overall. 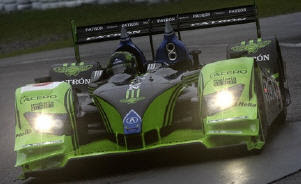 The Patrón Highcroft Racing triumph also helped clinch Acura’s first the LMP1 engine and chassis manufacturer championship. Gil de Ferran took the lead early Sunday in his No. 66 XM Satellite Radio Acura ARX-02a, but a gearbox issue forced for the 2003 Indianapolis 500 winner to pit early in the 131-lap race. De Ferran and co-driver Simon Pagenaud made seven pit stops throughout the event to nurse their machine home for second overall. Pagenaud still managed to record the race’s fastest single lap. The Lowe’s Fernandez Acura team, with drivers Adrian Fernandez and Luis Diaz, recorded third overall with the No. 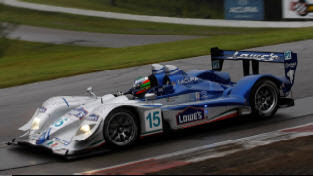 15 Lowe’s Fernandez Racing Acura ARX-01b sports car and won their seventh LMP2 class race of the year. The popular Mexican pair clinched the LMP2 drivers championship with the victory over the Dyson Mazda of Marino Franchitti and Butch Leitzinger. Fernandez survived a pit violation late in the feature, and trimmed a 15-second deficient in just twelve laps in capturing his team’s seventh LMP2 class triumph. The LMP1 championship battle between Patrón Highcroft Racing and de Ferran Motorsports moves to Road Atlanta for Petit Le Mans on Sept. 26 in the 1,000-mile classic.